FILE - Afghan farmers harvest raw opium at a poppy field in Zhari district of southern Kandahar province, Afghanistan, April 11, 2016. Afghanistan has produced a record 9,000 metric tons of opium this year, up 87 percent compared with 2016 levels. The sharp increase is recorded in a new joint survey released Wednesday by the Afghan Ministry of Counter Narcotics and U.N. Office on Drugs and Crime (UNODC). The production in 2016 stood at 4,800 metric tons in Afghanistan, the world's top cultivator of the poppy from which opium and heroin are produced. The new survey noted the rise in production is mainly an outcome of an increase in the area under poppy cultivation, while an increase in opium yield per hectare also contributed. "The area under opium poppy cultivation also increased to a record 328,000 hectares (ha) in 2017, up 63 percent compared with 201,000 hectares in 2016," according to the survey. The largest increase of yields, it said, occurred in the southern Afghan region where the average yield grew by 19 percent and the northeastern region, with a 14 percent rise. 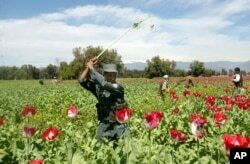 FILE - An Afghan police officer is seen destroying opium poppies on the field during a poppy eradication campaign in Nangarhar province, east of Kabul, Afghanistan, April 2, 2007. The Afghanistan director of UNODC, Mark Colhoun, called for an effective crackdown on revenue from the drug business among the steps needed to tackle the problem. "More attention needs to be paid to preventing illicit financial flows, identifying drug-money laundering, and enabling effective prosecution and confiscation of assets. This needs to be done in conjunction with other international experts and actors, as much of the illicit funds derived from drug trafficking are not located in Afghanistan but are located in banks outside of the country," Colhoun said. The U.S. military estimates more than 60 percent of the funding for Taliban insurgent activities comes from the illegal narcotics production. The United States has invested more than $8 billion in Afghanistan since 2002 to counter the illegal drugs, but the production levels continue to soar to record levels. "Increased insurgency and funding to terrorist groups is likely within Afghanistan, while more high quality, low cost heroin will reach consumer markets across the world leading to increased consumption and related harmful consequences," the survey noted. The number of poppy-free provinces in the war-torn country has also decreased from 13 to 10, it said. The provinces that lost their decade-old poppy-free status are Ghazni, Samangan and Nuristan. In the largest Afghan province, Helmand, where nine out of 14 districts are controlled or influenced by the Taliban, cultivation increased by 79 percent, accounting for about half of the total increase, the survey said. U.S. Special Inspector General for Afghanistan Reconstruction, John Sopko, while testifying before a congressional hearing earlier this month, blamed security and lack of a U.S. strategy to fight the illicit narcotics. "What concerns me is that when General Nicholson ... [testifies] that 60 percent of the funding going to the Taliban terrorists comes from narcotics trafficking and we have no strategy ... we are never going to win in Afghanistan if we don't focus on the whole narcotics problem," Sopko said. General John Nicholson is the commander of U.S. and international forces in Afghanistan fighting the Taliban insurgency in support of Afghan security forces.